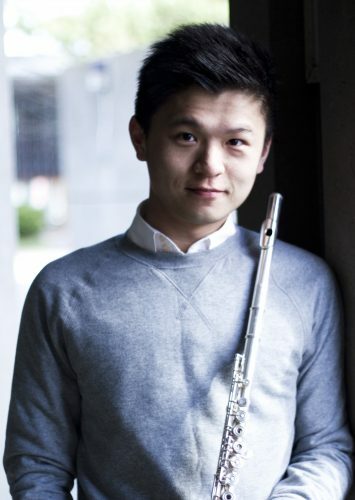 Born in Taiwan, Paul Hung entered the Langley Fine Arts School at the age of 13 and made his first concerto debut at the age of 16 at the Whistler Music Festival. He was then featured several times as the winner of the Vancouver Kiwanis competition, and awarded the Tom Lee Music scholarship for Excellence in Music Performance. He was a recipient of the Canadian Broadcasting Corporation’s “Galaxie Rising Stars Award” and placed Second in National Music Competitions 2008. Paul performed with the Vancouver Youth Orchestra as a result of attaining first place in the concerto competition in 2009. Soon after, he performed as a soloist with the Abbotsford Symphony and New Westminster Symphony. In May of 2011, Paul won a spot in the YouTube Symphony and performed with 100 other musicians around the world at the Sydney Opera House. As a passionate solo and chamber flute player, Paul performed in music festivals such as the Banff music festival, Domaine Forget, MusicFest Canada, Performing Arts BC, Vancouver Kiwanis Music Festival, Redshift Music Society and Health Arts Society. Paul also played as a substitute with Vancouver Symphony and Kamloops Symphony. Recently, he was the substitute principal flute at Vancouver Island Symphony and Okanagan Symphony. In 2015 to 2017 season, he served as the acting principal flute at Prince George Symphony. Paul was a student of Lorna McGhee, the principal flutist of Pittsburgh Symphony. He has also studied under Brenda Fedoruk; and then Christie Reside during his Master’s degree at UBC School of Music. He is currently a faculty of Vancouver Academy of Music and the St. James Academy.